The world would be... ...better?...Worse? What do you think would happen if the only professions were in comedic entertainment? Does jugglinhatchits belong in this group? 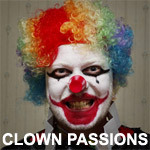 It Said Clowns I'm a Juggalo. looking for a lette. Does deadbodyman17 belong in this group? Does patricia2607 belong in this group?